Many parents, relatives, and caregivers enjoy creating handmade toys for their children. This is a really great way to continually give your children new materials to explore, without breaking the bank. Re-using materials from your home also sets a wonderful example for children of how to use re-purposed materials in a way that is environmentally friendly. Below are some examples of toys and games made by Pine Village’s talented teachers. We hope you enjoy looking through them and trying them at home! In our South End school, teachers glued magnets to Popsicle sticks so that children could use them to construct designs and shapes! This activity is great for older preschoolers, and Pre-K children! Though these sticks were bought new, this activity could also be done with any materials you have on hand at home! it should never be done with children under 3 or any child who mouths objects! the learning potential- are endless! 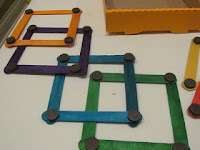 In our JP Revere Street school, one of our teachers recycled plastic lids to create colorful lacing boards. This is a great way to build fine motor skills, and a wonderful example of reusing items you already have at home. All you need is any plastic lid, a hole punch, and yarn, string, or even an old shoe lace! If you try this with yarn, try taping the ends to avoid fraying. Here are a couple of great uses for clothes pins! Teachers at Pine Village in Needham made this fun number matching game using clothes pins and a paper plate. Teachers at Pine Village South End made a similar game for color matching. Lastly, in our Kendall Square school, teachers glued clothes pins to cork boards so they can easily change which projects are up on the walls. These are just a few ideas for materials that are inexpensive and fun, and also promote learning through play. Leave us a comment and let us know- what are some handmade items your children enjoy using at home?